Shoot I wish it could be five, defnitley sounds interesting. Like to see the pics. lol they're awesome!!! how small are they?? You can't even see them in the tank pic!! The tank looks neat too, nice for a room. Very nice...dwarves are some of my favourites. Been a while since I have had an ongoing artemia hatchery, although I have 4-5 in storage. On chap I knew that spawned his seahorses cleverly ran his nauplii through an IV drip system to constantly feed his babies. lol, oh omg they are SO small!! Are they a natural species? 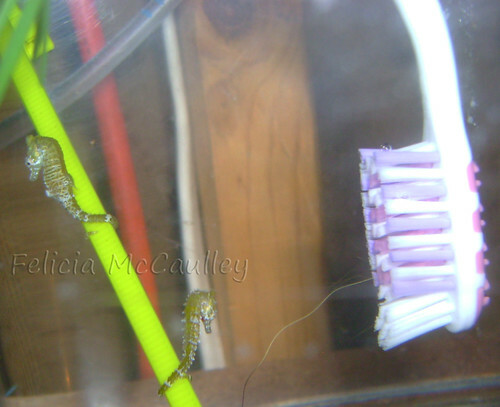 I know seahorses are small but these guys, were they man made?? Aw!! lol!! They look funny swimming ^^ A video of feeding time would be awesome Cynster! If that's not possible it's okay.